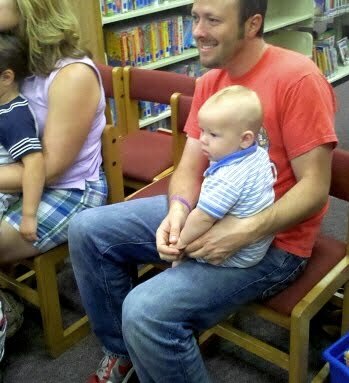 I took Isaiah to his very first storytime! 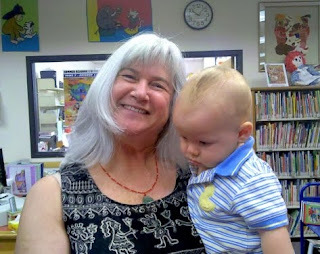 I remember attending storytime at the library when I was young, and it felt wonderful to continue the tradition. Kristen Barnhart (children's librarian / friend / former co-worker) led the storytime, and I can't wait to go back later this week. Hopefully Isaiah will come with me! In the photo below, Isaiah's staring at an older boy who was holding several books. And for some reason, the boy wasn't trying to eat them. Weird! Even though he was one of the youngest children there, Isaiah watched and listened so intently. Unlike some of the other children, he never once interrupted Kristen while she was reading. 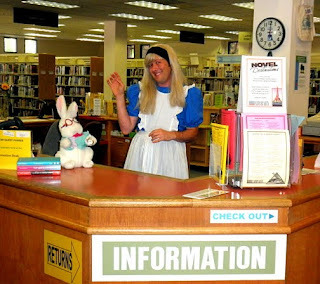 No, he has way too much respect for books and librarians to do that. Of course, he also doesn't know how to speak yet. 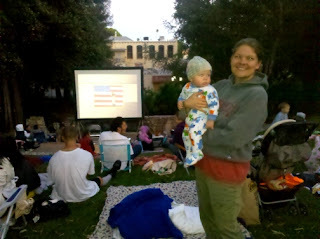 Because Isaiah behaved so well in the library, a few days later we took him to an outdoor movie. Over three Saturdays this month, the Parks & Rec department showed children's movies in an amphitheather across from the mission. When Over the Hedge came out in 2006, JoanMarie and I went on a date-night to see it with some friends. We both loved it! On family-night, we loved it even more. Congratulations to Bwyatt (a.k.a. Britney Wyatt) for being randomly selected to win the first round of Future Friday giveaways! To claim your goodies, send your mailing address to EmmaNelson4Ever@aol.com. If you don't know who Emma Nelson is, you will when you start reading The Future of Us! 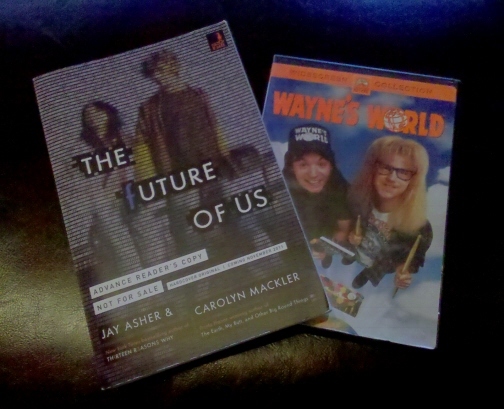 For our first giveaway, the bonus item is a DVD of Wayne’s World. This week, we want to know the title of your favorite movie released in 1996. To help you recall which movies came out fifteen years ago, just click here and scroll down to the alphabetized list. You don’t need to tell us why it’s your favorite, but if you feel like telling us, we’d love to know. If you haven’t seen any of these films (seriously? ), tell us which one you most want to see…and then go see it! JAY: The Hunchback of Notre Dame was the first movie my wife and I saw together. It wasn’t a date, another one of her guy friends came with us (Hey, Jodi! ), but it makes this movie my obvious choice. CAROLYN: I'd have to say Fargo, even though the scene where they're stuffing a body into the woodchipper still haunts me. But a pregnant cop Midwestern Frances McDormand was so...perfect. Oh, and maybe Flirting with Disaster, too. I'm a sucker for romantic comedies. I saw that one with my mom at a theater in NYC. As a child, I loved Star Wars. I also loved origami, though I couldn’t do it well (I still can’t even fold a decent paper airplane). So when I first heard about Tom Angleberger’s The Strange Case of Origami Yoda, I was intrigued. 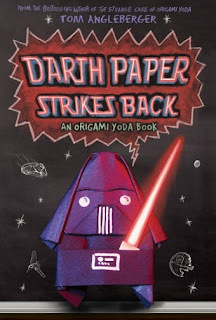 Then I heard Tom was working on another Origami Yoda book, Darth Paper Strikes Back. “Cool,” I thought. “I hope he writes even more.” One day, a funny idea popped into my head. I sent Tom an email, partly as a joke, thinking maybe he could use the idea if he ever wanted to write another Origami Yoda book after Darth Paper. Here's where it gets fun! This week, Darth Paper Strikes Back is finally available for you to buy. Like, right now! Why are you still reading this blog? Go…get…Tom’s…book! Do you have any idea how cool and exciting that is for me? No, you don’t. It is very cool and exciting for me. Very, very, VERY cool and exciting! In fact, it has inspired me to try folding my own Darth Paper (the book includes instructions right before the amazing Acknowledgments page). Paper cuts, here I come! On November 21st, The Future of Us will be released into the wild! Since Carolyn Mackler and I can’t wait for you to read our book, we’ll be giving away one Advance Reader’s Copy each week until the release date. All you need to do is return to this blog every Friday and leave a comment for your chance to win. And if you do win, we hope you don’t mind if we both sign the book before mailing it to you. Because we love alliteration (doesn’t everyone? ), we’re calling these giveaways Future Fridays. The first one will take place this week. The annual Society of Children's Book Writers & Illustrators summer conference has been over for several days, and I've finally recovered enough to post about it. This year's conference ties with my first conference in 2000 for memorable moments. So let's begin! Over 1,300 people attended this conference, and here's a portion of them as seen from the stage. When I introduced myself into the microphone, I told the attendees who pre-ordered one of these delicious donuts from me where they could get them. The first one was scooped up by Dan Santat, seen here nervously inspecting his bacon donut. Within seconds of this photo, that baby was gone! I critiqued ten manuscripts at the conference, sitting down with each author for twenty minutes. While I love speaking at conferences, doing critiques is almost as enjoyable...which, apparently, makes me very weird (something I've never denied!). Because I critiqued manuscripts, I was officially a faculty member. So I got to do something else I love...signing books! For some reason, there are a lot of great authors with last names beginning with A. Every time we sign books according to last names, I get to sit beside some of my favorite people. This time, I shared a table with Jim Averbeck. ...and Gary Paulsen. This guy can probably get away with calling himself The Most Interesting and Funny Dude On the Planet. Being in Los Angeles, there were movie people everywhere. But there was only one movie person I was excited to meet, Alison Greenspan from Di Novi Pictures (the producer of one of the two movies I'm most excited about seeing on the big screen...The Future of Us). We went to an amazing restaurant called Rock Sugar and I heard all about what's going on with "the next great Facebook movie." And yes, it does sound like it's going to be great! That night I emailed Carolyn Mackler all the details. I was still so excited over what I heard, I don't think I used paragraph breaks in that email, I just typed as fast as my brain let me. For my costume, I dressed in Ralphie's least favorite pjs from A Christmas Story. Not everyone knew why I was dressed like this, but the cool people did! One of those very cool people was Stephanie Roth Sisson, a local illustrator and good friend. 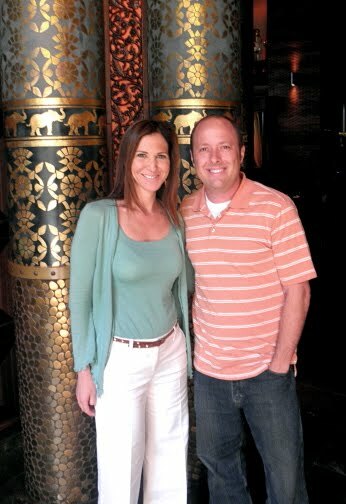 Someone who's felt like a friend for years, though this was the first time we've met in person, was Alan Silberberg. Alan was the well-deserved recipient of this year's Sid Fleishman Humor Award. At the faculty afterparty, I finally had the chance to speak one-on-one with one of my (and probably your) literary heroes. 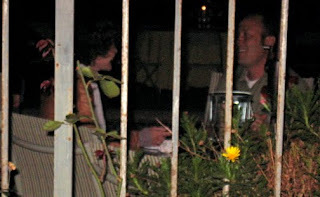 My friend Jolie Stekly saw this conversation occurring and decided to take a paparazzi-style photo. So who was I eating peach cobbler with? 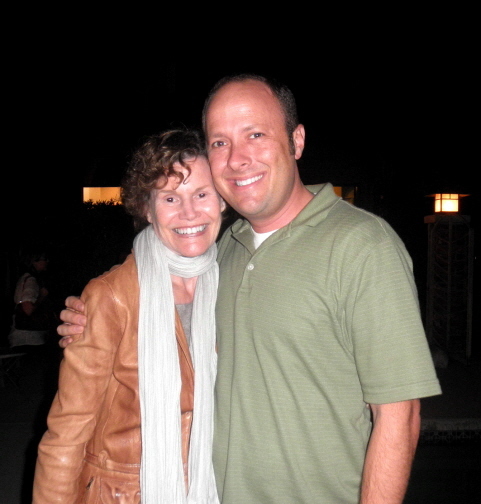 Oh, just someone named Judy Blume. Take a picture and you could win an e-reader pre-loaded with some of the best teen novels! The theme for this year’s TRW (Teen Read Week, not Thirteen Reasons Why) is Picture It @ your library. As part of the celebration, YALSA (Young Adult Library Services Association) wants to see your interpretation of a teen book title. Not your favorite character or scene. Not an abstract thematic analysis no one can figure out. The title! You can be serious or silly, but you must use creativity and you’re required to have fun. More info on the contest can be found by clicking here. And the entry form can be found by clicking here. Five finalists will win bookbags stuffed with teen novels from Penguin, including signed copies of Thirteen Reasons Why and The Future of Us. (You’ll also win a bit of fame and glory.) One grand prize winner will get that e-reader! (You’ll also win a little more fame and glory than the finalists.) As the 2011 TRW spokesmodel...I mean, spokesperson...I'll be judging the contest. You have from now until the end of October to enter, so click away!